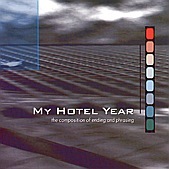 Commercial punk rock splashed with Emo, My Hotel Year is nothing new. Nor are they anything exciting. Their songs sound like every other band that writes emo-punk songs, and their lyrics are nothing to stop and pay attention to (or even read in the CD booklet). With weak, lackluster hooks and run-of-the-mill rock, My Hotel Year just doesn't make the grade. I'll give this a D.